A bagged cereal from Quaker. The cereal pieces came in the following shapes/colors: an orange rhino, a red and yellow snake, a purple and white gorilla, a green crocodile, a light green turtle, an orange and yellow bird, a yellow banana and a blue and yellow jeep. What do you think of Marshmallow Safari? This was one of my favorite morning cereals. I would be overjoyed if it made a return. 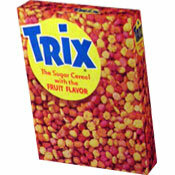 I absolutely LOVED this cereal! And, I was devastated when they stopped producing it. 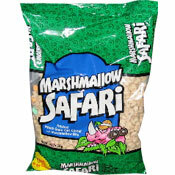 Nothing comes close to Marshmallow Safari! Love them! The Quaker version is great! The Malt-O-Meal version is disgusting! I've been searching high and low for this cereal since it was removed from the grocery aisles about 7 years ago. The best thing a kid could ask for, for Christmas, would be for its timely return. Looking for a miracle! This cereal was awesome! Everything you liked about Lucky Charms but with a better tasting cereal bit!